A cast-iron sculpture by renowned artist Antony Gormley is to remain in place permanently after it was bought and granted planning permission. The abstract human form looks out over the Kilbrannan Sound to Arran from the rocks below Saddell Castle in Kintyre. Gormley, who is most famous for the Angel of the North, made the sculpture in 2015 to celebrate 50 years of the Landmark Trust. It was one of five placed at trust properties around the UK. The life-sized figures, together known as Land, were originally to have remained in place until May 2016. The other four were removed as planned last year. They have been returned to the artist who will use them for future projects. The Kintyre sculpture, called Grip, is the only one to get a permanent home. It has been purchased for the trust by an anonymous private donor for an undisclosed sum. It has been granted planning permission by Argyll and Bute Council. 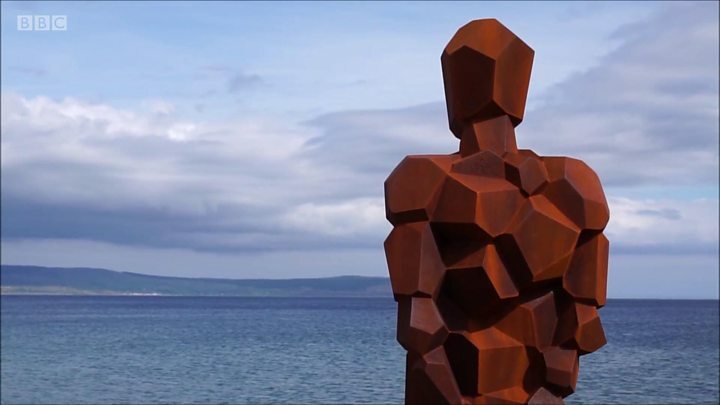 Gormley said: "There is an excitement about making a sculpture that can live out here amongst the waves and the wind, the rain and snow, in night and day. "The sculpture is like a standing stone, a marker in space and time, linking with a specific place and its history but also looking out towards the horizon, having a conversation with a future that hasn't yet happened." Caroline Stanford, who managed the Land installation, said: "Grip's human scale and magical setting make it a deeply moving work by one of this generation's finest artists. "We are so grateful to our wonderful donor for enabling it to stay in Scotland for good." The Landmark Trust has owned Saddell Bay since 1975. It has restored each of the six buildings on the bay and they are available for self-catering holidays.